Figure A38. Himalayas anomaly, interpreted as the Himalayas slab, with (horizontal) [vertical] cross sections through (A)[D] the UUP07 p-wave) and (B)[D] the combined SL2013 and S40RTS s-wave models at 750 km; C) the location of the modern geological record that we interpret to have formed during the subduction of the slab. The Himalayas anomaly (Figure A38) is located below the northern part of the Indian continent from the upper part of the lower mantle up to the upper mantle. In previous tomographic studies it has been referred to as the IV (Van der Voo et al., 1999b) or Hi anomaly (Hafkenscheid et al., 2006), and it was also imaged by Li et al. (2008), Replumaz et al. (2004; 2010b; c), and van Hinsbergen et al. (2012). Van der Meer et al. (2010) followed the interpretation of Hafkenscheid et al. (2006), who suggested that this lithosphere represents Neotethyan lithosphere that formed as back-arc lithosphere associated with the late Cretaceous Spontang arc. The Himalaya anomaly, however, is the shallowest anomaly associated with convergence between India and Asia, and consequently likely represents the youngest slab, interpreted to reflect either continental crust of Greater India (Replumaz et al., 2010c), or (partly) oceanic crust of Greater India that according to paleomagnetic data formed in Cretaceous time (Greater Indian Basin of van Hinsbergen et al., 2012). Given the northward subduction polarity of India below Asia, the southward dip of the Himalayas slab likely indicates that the slab is overturned (Replumaz et al., 2010c). Although the inferred nature of the lithosphere of the Himalaya slab differs in the scenarios of Replumaz et al. (2010c) and van Hinsbergen et al. 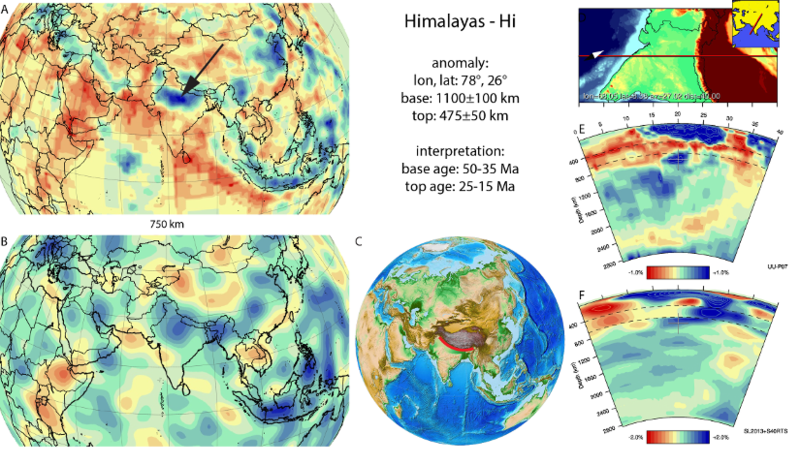 (2012l; 2018), the inferred age for top of the slab are similar, 20±5 Ma, after which time India-Asia convergence can be fully accounted for by intra-continental shortening and horizontal underthrusting of Indian lithosphere below the Tibetan Plateau. The age of the base of this slab is difficult to assess. Based on the volume of the Himalaya slab compared to India-Asia convergence rates, Replumaz et al. (2010b) and van Hinsbergen et al. (2018) estimated a ~35 Ma age, and consensus exists that the Himalaya slab represents Greater Indian lithosphere, i.e. lithosphere that subducted after the collision of northernmost Indian plate continental lithosphere with Asia around 50 Ma. We adopt a 43±8, Ma for the base of the Himalaya slab.